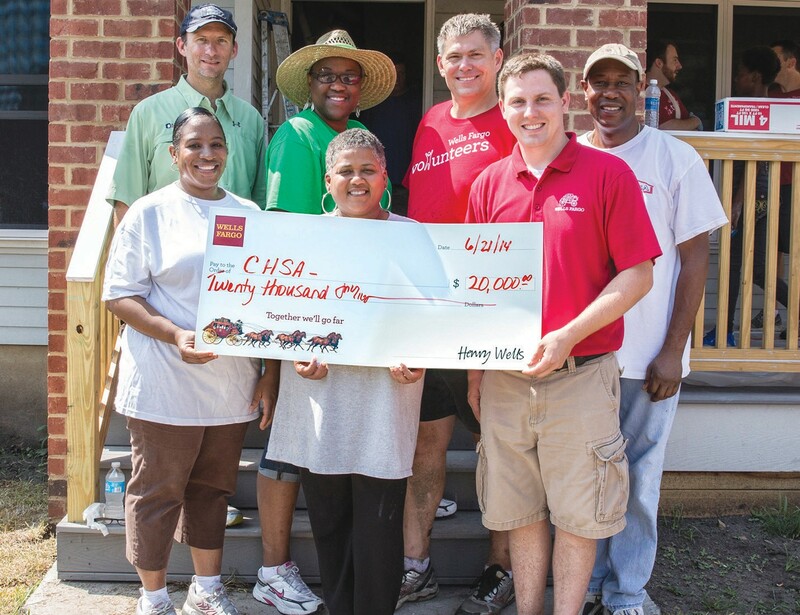 Wells Fargo presented CHSA with a check for $20,000 to help build a home for a family in savannah Gardens. It’s all part of Wells Fargo’s Community Service Super Saturday. Back row L to R: Andy Ubinski, A.Ramon Inc.; Anita Smith-Dixon, City of Savannah; Todd Householder, Wells Fargo district manager; Darryl Daise, CHSA. Front row, L to R: Deneen Young, CHSA; Lillian Grant-Baptiste YouthBuild Savannah, Jake Jordan, Wells Fargo store manager. Rather than taking it easy on this first day of summer, 70 Savannah volunteers aren’t letting the heat stop them from serving their communities. It’s all part of Community Service Super Saturday, where hundreds of red-shirted Wells Fargo team members and friends are welcoming summer in 23 cities across Georgia. Ideal for June, which is National Homeownership Month, housing for those in need will be a big focus. In Savannah, volunteers are laying sod and painting the interior and exterior of a home in Savannah Gardens, located at 16 Greencottage Way. Wells Fargo is presenting Community Housing Services Agency with $20,000, the largest grant awarded today. Volunteers from CHSA, the City of Savannah, and YouthBuild are joining Wells Fargo at Savannah Gardens. Youth- Build helps high school dropouts earn a trade in carpentry while they work to get their GEDs. In all, 29 volunteer activities are occurring today. Volunteers will help everyone from seniors to dogs and cats, serving at senior care centers, children’s organizations, food pantries, animal shelters and so much more. Wells Fargo is donating $120,000 to upgrade the housing situations of 12 families, either by building new homes or repairing existing ones. Five events are taking place in Augusta and four in Columbus. In other cities, including Americus, Athens, Dalton, Gainesville, Macon, Rome, and others, volunteers are showing their support at a single event.